This diserves it's own thread. Let's see the plans you drew up, the lumber you were gifted, and how far you got this weekend. I didn't get super far. 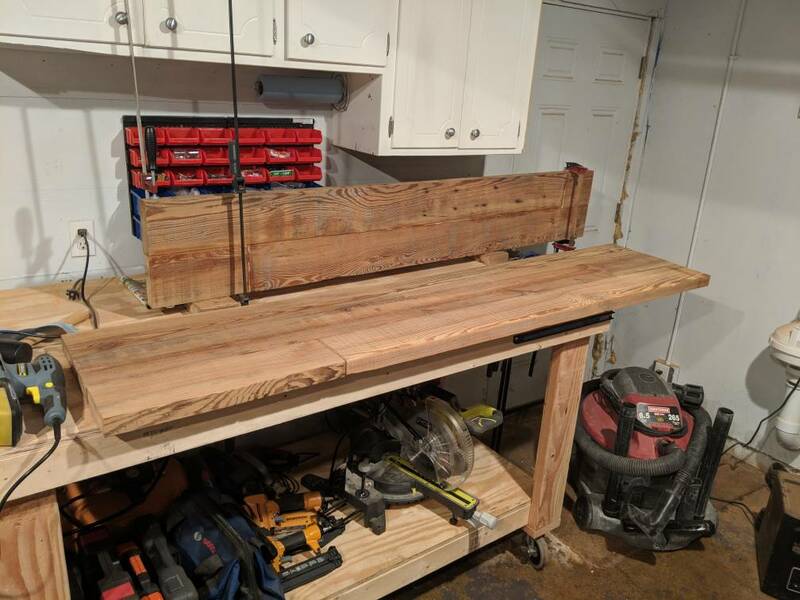 Mostly just cleaning up the wood all day Saturday and yesterday I started gluing the planks together for the bar top. I'll get some pictures tonight after work. wags83 wrote: I didn't get super far. Mostly just cleaning up the wood all day Saturday and yesterday I started gluing the planks together for the bar top. But I haven't needed to rip anything yet. I will though when I get the plywood for underneath it. But I'm a man and I have a table saw. I don't mean his saw tool, I mean his Kreg drill tool. It's specifically meant for screwing wood together that's butting up against each other. Tyler wrote: Source of the post I don't mean his saw tool, I mean his Kreg drill tool. It's specifically meant for screwing wood together that's butting up against each other. Ohhhh, I see. I have a Kreg jig for pocket holes. It's just a basic one though, I believe there are fancier ones out there. I thought about doing it that way, but I think it will be stronger this way and easier. Haha not quite. But now I'll have a bar in my basement where I can drink my homemade beer, so I guess it's close! Not a ton to look at yet but here are some pics. Some of the wood in it's original state. Comparison of old dirty wood vs. cleaned up. And the bar top being glued up. That looks great! 1/4inch play behind it? What are the dimensions? Actually what you're seeing is the bottom so plywood will go on that side. The base will be 6 feet and the bar top is a bit longer than that so there will be some overhang on the end. As it is now it's about 18 inches deep. Glued up the shelf server-side shelf and started sanding the bar top. I didn't realize how thicc those planks were before. I thought they were from the wall of a barn, those must have been structural. Tyler wrote: Source of the post I didn't realize how thicc those planks were before. I thought they were from the wall of a barn, those must have been structural. Yeah, I guess I don't know what parts of the barn they were from but they're mostly 2x6's. There are one or two 2x4's and a 2x10 that I haven't used or cleaned up yet. Some updated pics. Been working on it here and there when I have time. 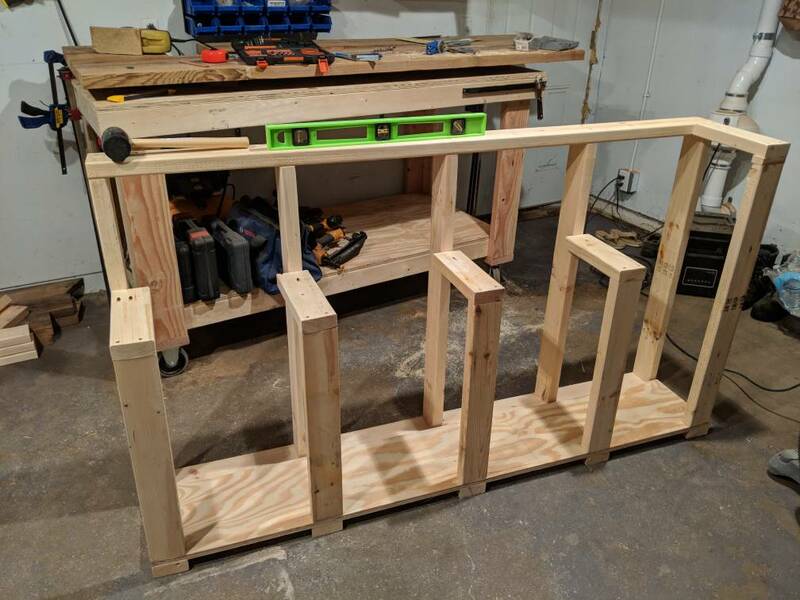 Built the bar structure tonight. I assume your garage floor isn't level so nothing is going to be level when you bring it inside. Haha probably. The beers will just tip over whenever they get set on the bar. Looking great though. Making it up as you go or working off plans you drew? Tyler wrote: Source of the post Looking great though. Making it up as you go or working off plans you drew? A little of both. I had a rough idea drawn up just to get dimensions down on paper but I've made some changes along the way. Put the first coat of stain in the bar top. You'll notice I had a little accident and now my work bench has an area that is stained.